He said: "We brought cumbia out to the 21st century, mixing it with electronic music." Buenos Aires, Argentina (CNN) -- As a child, Leonardo Martinelli studied classical music at a prestigious Buenos Aires conservatory. He now says his knowledge of the disciplined genre both aids and inspires him while creating his music, which meshes traditional Andean instruments such as the charango and bombo leguero with electronic samples of reggaeton and cumbia music. "I like not knowing what the results are going to be. I am always facing my music with that spirit," says Martinelli, 32. Martinelli's musical project, Tremor, is a member of Zizek, the eclectic collective of musicians and DJs in Buenos Aires that are producing some of the most progressive and surprising sounds in Latin America today. The group is leading the current global dance craze known as "cumbia digital," a modern take on the percussive 4/4 rhythm developed by African slaves in Colombia two centuries ago. "We brought cumbia out to the 21st century, mixing it with electronic music, computers and samples," says Grant Dull, aka El G, the co-founder and Zizek resident DJ. "Our stuff is made for the dance floor," says Dull, 33. Gaby Kerpel (aka King Coya), Leonardo Martinelli (aka Tremor) and Grant Dull (aka El G) rehearsing. Zizek is now packing dance floors around the planet. What started out in 2006 as a small, weekly gathering in Buenos Aires has exploded into a full-on global music phenomenon. Cumbia digital is now heard on the airwaves, in night clubs, and at parties throughout the Americas and Europe. During the past year and a half,, Zizek has performed some 70 shows in 17 countries, including illustrious slots at Denmark's Roskilde Festival and the uber-cool Coachella in California. In coming weeks, they will play shows in Denmark, Germany and France. The group recently celebrated their third anniversary with a raucous homecoming show in Buenos Aires, featuring Zizek regulars such as Fauna, El Remolon and special guest Andy Gillis, aka Uproot Andy, a New York-based DJ who has helped spread the cumbia digital sound in the United States. "Zizek is uniting all the emerging stuff right now, so it's like one of the newest, biggest things. And it's really good for the musicians here," says Gabriela Ray, 25, an Argentine journalist. Buenos Aires has attracted a slew of international artists in recent years, thanks to its vibrant cultural offerings and low prices. Texan Dull moved here in 2004 and was one of the first ex-pats to recognize the potential in mixing local and foreign sounds. "Buenos Aires is a melting pot of ideas. It's a cauldron of sounds and rhythms. ... and it kind of just gets mashed up and taken to new places. And that is what Zizek has been able to do: to show the richness of ideas from these producers," Dull says. Equally important has been Zizek's ability to bring cumbia out from the shadows and to the masses, defying social stereotypes in the process. "There was a hybrid of cumbia that came about last decade that was called cumbia villera, which is cumbia from the slums, the shantytowns. So it kind of has that same bad rap that gangster rap or hip hop might have gotten back in the States. Our stuff is more art house and experimental and our club tries to bring everybody together just for good music," says Dull. Named in honor of contemporary Slovenian philosopher, Slavoj Zizek, the Zizek club now has a spin-off record label, ZZK Records, which has already released six albums. There is talk of interest from the major labels in the United States. Gaby Kerpel is perhaps the most experienced and accomplished member of the collective. He wrote the music for both "De la Guarda" and "Fuerza Bruta" the wildly successful Argentine live-action, aerobatic theater shows that have toured the world for the past 15 years. Kerpel has also collaborated with Oscar-winning Argentine composer, Gustavo Santaolalla, who produced his album, Carnabailito. 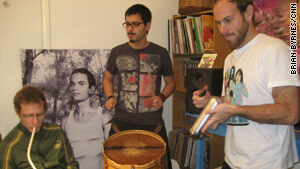 At Zizek, Kerpel performs under the alias King Coya, and his sets feature wild, computer-generated samples of cumbia and hip hop, mixed with the live sounds of the melodica and the vocal stylings of singer La Yegros. "Zizek is a global movement, and it's growing," says Kerpel. "I'm thrilled to be a part of it."